My husband and I had many unrealistic expectations of our homeschool adventure. We each had our own ideas about what our day would look like and what our roles would be in this joint venture. We were mostly wrong! Now that we have a few years of homeschooling under our belts it was time to reevaluate and have a little performance review…. What does our day actually look like to my husband? He has realized that homeschooling doesn’t fit into a neat box of standing in front a chalkboard and teaching. There are so many components to our day that I couldn’t possibly list them all! And that doesn’t include the house work and the day-to-day things that need to be done like errands, phone calls, and appointments. To my husband, our homeschool day is packed with parenting and schooling and each day has it’s own flavor. He expected a little more predictability and stability. Nope, every day is a new kind of crazy! I’ve fallen into a role that is 70% teacher/mom, 20% wife, and 10% housekeeper – according to my husband. So, I don’t get done as much housework as he expected – but it’s not for a lack of trying! I’m also a lot more involved in parenting and homeschooling than he thought was possible. I think sometimes he misses his wife – who is often replaced by a harried teacher who is trying to plan and grade in the evenings or just simply collapses on the couch from exhaustion. Of course, it’s important to find balance, and our new ratio takes up 100% of my time. Thankfully my time is well-spent but I make sure that there is some time for each person within my packed schedule. What is my husband’s role? Guess what my husband does in our homeschool? He has taken up the role of janitor and chef! Yes, he finds that the way he can be most helpful is to pitch in and clean up. He does dishes, laundry, vacuuming, and even scrubbing bathrooms and floors. Many nights I need help with dinner or I need to get a head start on meals for the next day, so he jumps right in with slicing, dicing, sauteing, and cooking (but not much baking!). He has realized that while I’m home most of the day, I have a full time job that limits the amount of chores I can do around the house. Between taking care of the littles and filling their days with learning, I have a hard time getting to “everything else.” Therefore, he has become a jack-of-all-trades and simply pitches in wherever help is needed. My husband does enjoy hearing what the kids are learning. He often sits with them at the dinner table or in the evenings and asks what they have learned lately. He then enjoys quizzing them and paging through their notebooks with them as they proudly show off their work. Of course, I try to fill him in weekly on the main themes we’re covering so he’s at least a little bit caught up. That way he can use what I’ve told him and ask the kids questions to see what exactly they remember from their lessons. He’s been schooled a few times from the kids in history and science lessons. Homescholing is for the parents too!! Another thing my husband does is help with read alouds or with independent work. Occasionally he helps the kids with math lessons or a science experiment. He also gets roped into read aloud time on a weekly basis. While he does NOT enjoy reading aloud, he piles in the bean bag chairs and reads chapters at a time to his attentive audience. The kids absolutely love reading with daddy! He never thought he’d be doing much substitute teaching and he was right. Usually he’s gone all day at work so that leaves me at home and in charge of lessons. The few days he’s stayed home because I was sick or out of town, he did a few lessons but found that the kids had a hard time adjusting to their substitute teacher and his different ways of doing things. So, he’s content to help in a few areas but doesn’t have a desire to take over teaching any subjects on a full or even substitute basis. What is our homeschool identity? My husband was so worried about how homeschooling would change us and how we might lose our identity as the homeschooling years passed by. Well, he’s discovered that he was completely wrong. Homeschooling hasn’t changed who we are as parents or as a family. We are still the no-TV watching, suburban living, corporate working, Christ-loving, eclectic family that we were before we started. In fact, my husband believes we have changed people’s perception of homeschooling as we’ve talked to others about our experiences. We’ve learned that there is every kind of homeschool family and we are not defined by our role as homeschoolers. Instead, we’ve redefined homeschooling and made it fit our family lifestyle. My hubby is always happy to share what homeschooling is to our family and how we fall somewhere outside of the homeschool family stereotype. What do I need from my husband with regard to support and encouragement? I need help around the house because it is so hard to find balance in teaching and cleaning. Our house is very, very lived in! I need a little extra help with some homeschool projects or read alouds. It’s hard to do projects with little people making messes and it’s tough to read aloud over all the noise. I need extra one-on-one time with the kids when we’ve fallen behind or if one of them is struggling in a subject. I need him to entertain the other kids or take them out of the house completely so we can have some quiet time in which to work and catch up. I need a sounding board for when I’m trying to organize our schedule or choose curriculum for the year. Sometimes all I need is a listening ear and an outside opinion as I try to sort out my thoughts. I need field trip help sometimes. It’s hard to wrangle all 5 kids on a field trip or even to pack for a field trip. I sometimes need help with the preparation or need a helping hand to tag along for the morning. I need his encouragement and grace as I try to figure out what works best for our family, make decisions on what we will be learning, and try to recover and grow after mistakes. What does he need from me with regard to our homeschool adventure? He needs me to be able to turn it off. My husband wants me to be able to have a conversation that is about something other than kids or homeschooling. He needs me to be able to be “me” and not be constantly thinking about school or curricula. He wants me to maintain my identity outside of home educator. He needs me to be able to take breaks from the grading and planning and enjoy family time or time with him. He wants me to be able to step out of the homeschool room and leave my worries and work there for the evening. He needs my full attention. Above my role as homeschool mom, I’m a follower of Christ and a wife. These jobs should take priority. My husband wants me to make time for our relationship and make time for him. He needs me to maintain my identity and my hobbies. He doesn’t want me to lose my identity in the sea of curriculum research or education philosophies. He wants me to be the woman he married with passions for the hobbies and activities that I enjoyed before kids. He needs time to relax after the stresses of his day. Sometimes we just need family time and need to take a break from all school work to just enjoy each other. In those moments, I need to be flexible and be able to alter my schedule. He needs my support for his career endeavors and his school work. He needs me to stand behind him, encourage him, and be proud of his achievements in this areas. And sometimes he needs some extra time to focus on those things in order to catch up when he’s feeling behind. Check out these wonderful bloggers who are participating in the blog hop with me! To visit all the bloggers participating in this blog hop click on the banner below! 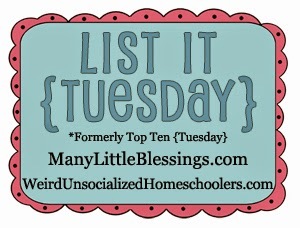 Linked up with List it Tuesday! what a fantastic, well thought out post. My husband taught math with my kids for a few years to help with the workload but he started going on my work trips so I ended up finding a math curriculum that taught it for me.. When he comes and helps now it's hard because his way of teaching is different than mine like you mentioned.. It's all about balance and sometimes we got it all together and then the other times we are just working through it day by day.. Thank you! This has been a huge learning process for both of us. We've found it works best with me as the main teacher and him helping out with only a few things. He's happier giving me a larger budget to buy materials that are put together for me rather than give daily help. But that works for us! I'm sure our dynamic will change yearly!